The safety video is backed by the soundtrack It’s Kiwi a remake of the popular RUN-DMC song It’s Tricky and In the Neighbourhood by Sisters Underground, produced by Josh Fountain of Auckland’s Golden Age Studios. It’s Kiwi Safety is the largest scale safety video Air New Zealand has ever produced, with a 600-strong cast. 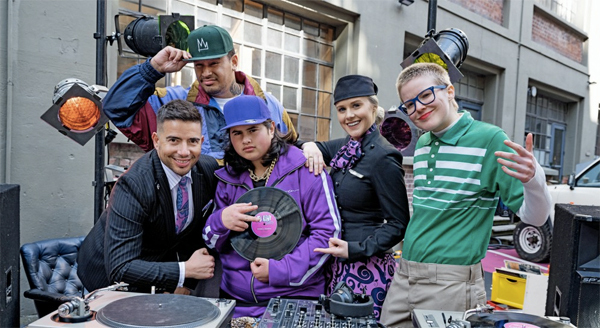 The video stars well-known Kiwi actor Julian Dennison, local musicians Kings, Theia and Randa as well as talent from 30 community groups across the country, including the Rewa All Stars dance crew from Auckland, surf lifesavers from Dunedin, curlers from Maniototo in Central Otago and the Mosgiel Brass Band.